‘The Beano’ (like ‘The Beezer’ before it) hypothesises that our perceptions and actions are managed by five little men living in five separate rooms in our skulls. Although modern neuroscience has yet to locate any Numskulls at the helm, it does support the notion that our brains are divided into discrete ‘compartments’, each in charge of a different function or set of functions. Mapping those compartments more precisely – and understanding how the tissue structure in each region allows us to do specific things – is a fundamental challenge for neuroscience. Thanks to advances in imaging techniques, we now know roughly which bit of the brain looks after what. Functional magnetic resonance imaging (fMRI) – which measures blood oxygen levels in tissue – has shown which regions are activated when we make a decision, take a risk, control our temper or play a game of tennis. But the brushstrokes are broad and the picture remains impressionistic. We haven’t yet found a safe, non-invasive way to penetrate the deep tissues of the living human brain – or to reveal its microscopic cellular structures (cytoarchitecture). Neither do we know which differences in tissue composition between disparate brain regions account for these different functions. What variations in the type, size, number and patterning of cells and other micro-structures in a particular brain region allow us to evaluate two choices as opposed to run for a bus, for example? A two-photon micrograph showing layer 5 pyramidal neurons from a cortical brain slice. Credit: Professor M Hausser/UCL, Wellcome Images. For the past ten years, Heidi has been working to get a better handle on the correlation between brain structure and function. In 2001 (having completed a Wellcome Trust four-year DPhil/MSc in Neuroscience at the University of Oxford), she won a Wellcome Postdoctoral Training Fellowship in Mathematical Biology at the Oxford Centre for Functional MRI of the Brain. “The methods in brain imaging involve a lot of mathematics and statistics. So to be able to answer new biological questions, I wanted to get a better understanding of what you could and couldn’t do with the techniques available to interrogate brain imaging data,” she explains. She used her Training Fellowship to develop techniques using another form of MRI – diffusion MRI, which measures the diffusion of water molecules within the brain. The shape, orientation and size of the tissues all influence how easily water can diffuse around them, so measuring that process can provide an image of their structures. To date, most research into brain structure has focused on the grey matter, because that is the tissue containing the cell bodies of our neurons – generally considered to be the all-important information-processing units in our brains. Heidi and colleagues, by contrast, applied the new MRI techniques they had developed to white matter – the long tracts of connecting fibres that protrude from the neuronal cell bodies and form pathways throughout the brain, allowing separate regions to communicate. “Each bit of the brain is doing a different job,” she says. “And to do that job it needs certain types of information or inputs about the world, your body, your intention. It also needs certain outputs to control your body, or to control your speech. A few research groups had used diffusion MRI to trace some of the white matter pathways through the brain. Heidi and her team wanted to go a step further and see whether they could use these changing structural patterns in the white matter to draw more precise boundaries between discrete functional regions. To explore the possibility, they selected an area at the top of the brain – the medial frontal cortex, sub-regions of which were already known to regulate disparate cognitive functions, such as planning, decision making and moderating social behaviour. The team imaged the brains of volunteers using both fMRI and diffusion MRI and used the results to divide the medial frontal cortex into discrete regions (volumes), on the basis of function and white matter patternings respectively. When they compared the two sets of divisions, they found an abrupt change in white matter connectivity patterns in exactly the same places fMRI had indicated were likely to be borders between functionally distinct regions. It was a startling revelation of a strong and direct relationship between structure and function. Illustration of a network of nerve cells in the brain. Credit: Benedict Campbell, Wellcome Images. The findings, published in 2004, provided the first demonstrations of how MRI could be used to divide up cortical regions based on their white matter connections, giving researchers a new strategy to study organisation elsewhere in the brain. The best relationships evolve and adapt in response to circumstances, and over the past decade or so we’ve seen that this is also the case for our brain’s structure-function partnership. The division of labour by brain region is by no means set in stone; indeed, it looks as if extensive ‘rewiring’ is possible even in adult brains, allowing new regions to take over the job of other regions that have been damaged by stroke or injury. Studies by various research groups using fMRI had shown new areas of brain activity appearing when patients recover limb movement after strokes, suggesting they were taking over the function of damaged areas. In 2002, Heidi and colleagues used transcranial magnetic stimulation (TMS) to temporarily disrupt these new regions, showing that patients depended on them to make movements. This provided the first actual proof that these brain regions really had taken on new roles. Shortly afterwards, it became possible to detect changes in tissue structure when regions take on new functions – something that can happen when we learn an entirely new task, as well as to compensate for injury in another part of the brain. In 2004, researchers showed that conventional MRI could detect a grey matter change when people learn to juggle. A couple of years later, Heidi and colleagues did a similar experiment, using diffusion MRI, to find out whether learning to juggle is also associated with strengthening of the white matter pathways. The findings, published in 2009, provided the first demonstration that white matter in the adult brain also changes its structure as a result of experience. Growth in grey matter is unlikely to be due to the creation of new neurons – something that seems to occur rarely and only in a few specific brain regions. Other possibilities include growth of existing neurons and their processes, or an increase in the number or the size of glial cells – a type of cell that has, until recently, been credited with little importance. Pyramidal neurons forming a network in the brain. These are nerve cells from the cerebral cortex that have one large apical dendrite and several basal dendrites. Credit: Dr Jonathan Clarke, Wellcome Images. 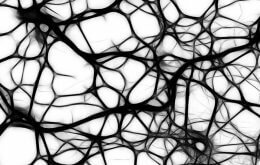 Glial cells used to be thought of merely as support cells; as a scaffold for the neurons, which are doing the difficult work. But over the past five to ten years, it has become increasingly clear that they are far more sophisticated and dynamic than first imagined. “There are at least as many, and in some brain areas far more, glial cells than neurons in grey matter,” says Heidi. “They can potentially exchange signals and interact very closely with neurons. They also divide to create new cells, unlike neurons. That seems to be happening all the time and there is some evidence that it happens as a result of experience.” As yet, the question of whether glial cell growth or some other cellular events are driving grey matter change hasn’t been answered for sure. To try to get a clearer picture of precisely what is driving the changes in both grey and white matter, Heidi plans to do parallel studies in rats and people. In many important respects, our brains are similar in tissue structure and function (if not in size) to rat brains. Tissue changes induced by learning in the rats’ brains will, therefore, give a good indication of the same processes in the human brains. With that end in mind, she will be doing another parallel experiment – a clinical trial to test whether non-invasive brain stimulation can improve movement in stroke patients. The technique, called transcranial direct current stimulation, involves placing two rubber electrodes on the patient’s head over the motor area of the brain and passing a small current between them while the patient does various training exercises. She warns, however, that we still need to find out much, much more before we really understand what’s going on. The brain is a mind-bogglingly complex organ (pun intended). And the gap between cell culture experiments and fully fledged people learning to juggle is vast – one that involves the incredibly finely balanced coordination of a multitude of cells, proteins, brain compartments and whole-body physiological systems. In some ways, the notion that it could all be managed by five little men in five little rooms in our skulls is no more extraordinary. Top image: A digitally enhanced MRI of the human head showing the brain and spinal cord in blue and green and other tissues in red and pink. Credit: Mark Lythgoe and Chloe Hutton, Wellcome Images. Johansen-Berg H. Changes in connectivity profiles define functionally distinct regions in human medial frontal cortex. Proc Natl Acad Sci USA 2004;101(36):13335-13340.